I am an awakening elder and have studied meditation, healing and yoga for most of my life. As a holistic health practitioner I wish to share gifts and tools I have learned over the years. I know as an Elder, I am here to support love and BE Peace, in the eye of the storm in these momentous times, where we Forgive the unforgivable, Speak the unspeakable, and support others coming into their deep knowing, beauty and power. And where we are activating Light, Peace and the re-greening of Earth, supporting the paradigm shift of humanity from being destructive Consumers to becoming Guardian Restorers with deep reverence for all Life. I have the tools from my life experience, being a mother and being a bridge builder from the old to the new; having worked in mainstream medicine as well as complimentary medicine. There is a growing integration in me, of the healing tools I have learned, also of the healing principles we use in homeopathy as well as with sound. I have been a homeopath for 30 years and a sound healer for 20 years. 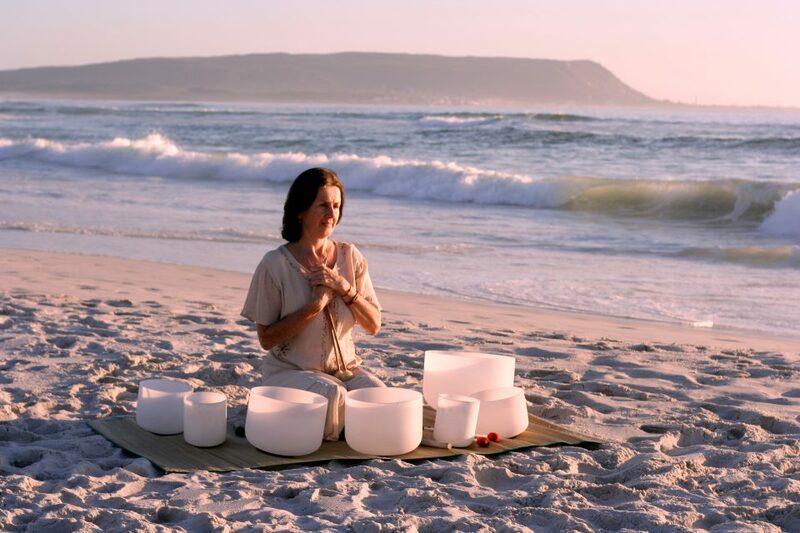 Crystal sound healing is a powerful and gentle form of healing. With the sound it is possible to work with large groups as well as individuals. I am a world traveler and have lived in many locations on different continents. I have had many teachers. I lived in South Africa for 5 years, helping a charity (NGO) and after experiencing a serious trauma/ life lesson /opportunity, I learned much about what deeply heals and can powerfully be there for others. In many ways humanity is suffering from collective post traumatic stress disorder, following the legacies of wars and living in a paradigm where money, power and survival rule, over love, cooperation and respect for Life, for humanity, for all our relations, our Earth and all of nature. I am currently based in Quillan, in the south of France, close to beautiful mountains, rivers; wonderful walks, trails and lakes. There are many special locations nearby such as, Rennes les Bains, Rennes le Chateau and ancient Cathar sites such as Peyrepertuse and Montsegur. Many legends abound with regard to Mary Magdalene. Nature in this area is very pristine and luminous. From here I run groups, small and larger retreats, one to one sessions, group crystal sound healing sessions, workshops and ceremonies. I am available online, and hope to build up a Global -Village-Community, a Creative-Hub building a field of love, authentic friendship, healing, cooperation and reverence.